Happy almost Friday! It's been nice (and hectic) to be back to a regular work schedule this week and for the first time in awhile I was able to do my weekly Publix shopping on my normal day of Thursday. 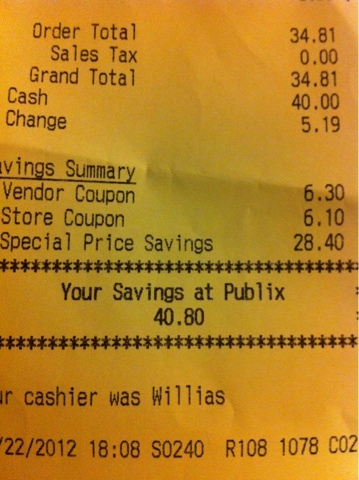 Nothing crazy this week for me at Publix. The sales were good but we are just so well stocked on so many things that I don't feel the need to spend the extra money taking advantage of some of the deals right now. Also, as I mentioned last week, I haven't been on my couponing game lately and I am attempting to get back into things now that life has settled down a bit. 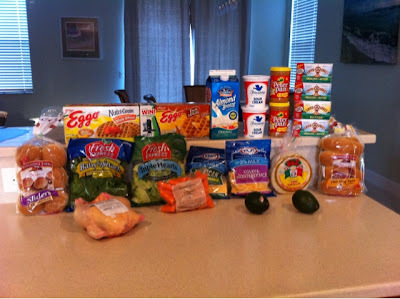 I had very few coupons this week and my recipet below is a perfect example of how you can save money by shopping smartly even without coupons. Today I bought meat at Publix (just a chicken) for the first time since my overage stock up trip. We actually still have some meat in the freezer (a pack of the chicken and one pack of the ground beef and the pork loin from overage trip and a whole chicken left from a sale awhile ago) but I want to keep our meat supply stocked when there are sales since I found that there were really no good deals on meat this past summer. I wanted to use my $5/$50 Alberston's coupon from this week's flyer but my total before coupons didn't hit $50 so I had to use one of my precious $5/$30 Enjoy The City coupons. Oh well... I stayed right around 50% this week which is ok with me since I got cheap butter, BOGO peanut butter and some veggies. Make sure to link up below and show me how you did this week!